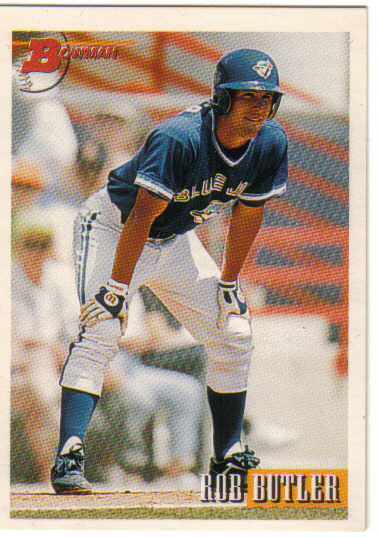 Canadian Baseball Card of the Week: 1993 Bowman Rob Butler. In 1993, this Toronto native became the only Canadian player to earn a World Series ring with a Canadian team. He played parts of four seasons in the big leagues with the Blue Jays and Phillies. He now operates the Home Run Baseball Academy in Ajax, Ontario. – It’s hard to believe that Oakland A’s general manager Billy Beane allowed Scarborough, Ont.-born catcher George Kottaras to be claimed on waivers by the Kansas City Royals. Though not a high average hitter, Kottaras managed an impressive .409 on-base percentage (OBP) in 58 games with the Milwaukee Brewers last season before joining the A’s. He seemed a perfect fit for Beane’s “Money Ball” model. But on January 16, the A’s acquired catcher John Jaso, who’s the same age as Kottaras and recorded a .394 OBP with the Mariners last year, which made the Canadian catcher expendable. Kottaras will now back up Salvador Perez with the Royals. – Three years ago, I was pretty excited about the success that Canadian starting pitchers were enjoying at the big league level. But as the 2013 season approaches, Jeff Francis (Vancouver, B.C.) will have to pitch his way into the Rockies’ starting rotation and Rich Harden (Victoria, B.C.) and Erik Bedard (Navan, Ont.) have both signed minor league deals with the Twins and Astros respectively. They will all be fighting for roster spots this spring. Here’s hoping they can rejuvenate their careers this season. – Lost in the news of the deaths of Stan Musial and Earl Weaver was the passing of former Toronto Maple Leafs reliever Bubba Harris. The 6-foot-4, 204-pound right-hander, who also pitched for parts of three big league seasons with the Philadelphia A’s and Cleveland Indians, toed the rubber for five games with the Leafs in 1951. In all, he pitched in parts of 11 minor league campaigns before retiring to Florida to serve in several prominent executive positions – including a tenure as a labour advisor to the state governor. He died in Nobleton, Florida at the age of 86. – We hear a lot about Joe Carter, Roberto Alomar, Paul Molitor, John Olerud and other key members of the Toronto Blue Jays’ 1993 World Series-winning squad, but whatever happened to reserve outfielder Willie Canate? The 6-foot, 170-pound Venezuelan hit .213 in 38 games that season after the Jays purchased him from the Reds on April 13. If you recall, Canate entered Game 5 of the 1993 World Series as a pinch runner after Pat Borders had singled with the Jays trailing 2-0 in the eighth inning. Canadian Rob Butler followed with another single that moved Canate all the way to third base with nobody out. Rickey Henderson then bounced a grounder back to Schilling who caught Canate too far off of third base. The little-used outfielder was tagged out in a rundown, essentially snuffing out the Jays’ rally. That would be Canate’s final big league appearance. Baseball Reference shows that he played in the minors in the Jays organization in 1994 and 1995 and then in the Mexican League in 1997. But then he disappeared from professional baseball. A google search produced no information on his whereabouts. Anyone out there know whatever happened to Willie Canate? – If you haven’t already done so, please “LIKE” the Cooperstowners in Canada Facebook page. I update this page regularly with great vintage photos and with links to Canadian baseball stories. Thanks again for all your support. Good stuff, Kevin–I enjoyed reading your observations etc. Thanks for the kind words. Glad you enjoy them.